My time being based at the Collegiate Academy Trust is now over. The resources I have created will hopefully assist lessons and revising students for years to come! The resources I have created cover some of the trickier areas of geography, such as rivers, exam questions and volcanism, topics that even the most talented geographer can find testing at times! Working with these areas created an extra challenge, not only to create the resources in the first place, but make them as interesting and enjoyable as possible. As you can see I’m only on part 3, so, what’s to come in the final chapter? My spare summer time will be spent creating, what I hope to be, an all-inclusive guide on my rock loaning scheme. I intend to have a page for every specimen, describing the specimen itself, describing and explaining where it is relevant in the curriculum and suggesting how it could be taught in order to fully utilise the specimen. I have completed my ‘wish list’ for the local geology museum and so should be going there any time soon to photograph and log the available specimens for my guide. 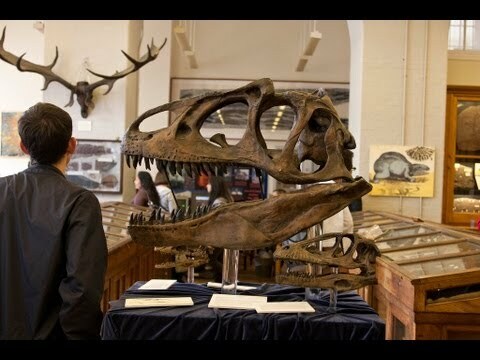 A picture of the Lapworth Museum of Geology. Unfortunately I don’t think their dino head is for loan! I also intend to reflect on my time working for the charity.